Creating content is fun. I’m grateful to have a career where I use my mind and virtual pen to express myself. Interesting enough with my journey into podcasting, it’s like building a retaining wall. Developing the right amount content for a listening audience is akin to writing in the sense that material has to be… written. However, much like this blog, past posts are proving to be a foundation for what this page is all about (basically… my thoughts). As I’m preparing to put out more episodes of the Friends+Experts podcasts (https://anchor.fm/friendsandexperts), I realize this project is much like the one in my yard. The little retaining wall I stare at from my office window reminds me of the work that most won’t see. In order to keep the wall steady, I had to work to lay out the sand on the level and meticulously place each brick down. There was a lot of trial and error. Sometimes, the bricks were uneven. I stopped and restarted plenty of times. But once it was done, the rest was relatively easy. It was just a matter of putting each brick into its place. I was relatively pleased with the first episode. I had a strong guest host and we didn’t get too caught up with our ums and long-paused ands. Most of all, we didn’t take ourselves too seriously although we touched upon some serious matters. However like the retaining wall, most won’t see (hear) it, and that’s okay. The process of doing this is rewarding enough. It’s satisfying doing something that inspires myself and others. Plus, there’s more to come. Exciting times! It’s only because of a career change that I’m posting. I now have some free time. I did it again. Procrastinating. It’s been more than a year for new post. So much had changed since then. I have a son. He’s three months old. He’s getting big just like me. Right now, I’m laying on my couch holding my son and laughing at YouTube videos with my wife while watching the Cavs play the Nets. I’ll post more. I promise. Week Nine Picks: LeBron is back. Things are crazy right now. I have new opportunities to help me flourish and someone is coming back to Cleveland. There’s a lot of excitement in my home area of Northeastern Oho. It’s said that the most stressful moments come in a new career or situation such as new home or status like marriage or divorce. 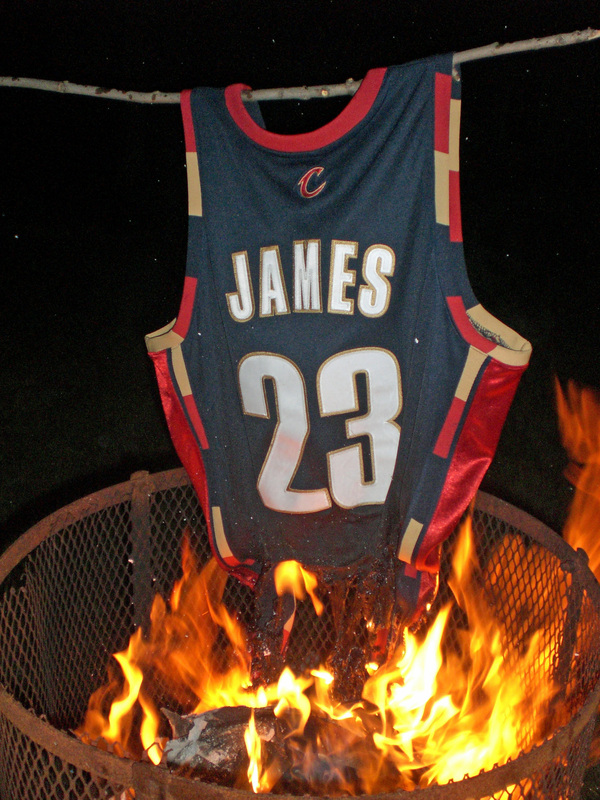 The marriage of LeBron James and the city of Cleveland ended in a messy divorce known as “The Decision“. The separation united the city with a hatred hotter than 10,000 burning suns. Literally. But as with love, separation makes the heart grow fonder. More than four years later, James returns to a forgiving fan base and turns the alley of West 4th Street into Times Square (well… that might have been the ESPN booth). There’s a lot of promise for the city that’s been lost for last several years. Cleveland’s relevant again and there’s hope. The sports nation looks toward the city to witness the beginning of something special or sports tragedy. The people have been set up to endure failure for so long. The Browns beat the Steelers one week only to lose to the worst teams in the NFL. The Indians make a playoff run only to lose steam down the stretch. It’s about time they get a chance to enjoy, at this moment, a chance. A real chance to compete for a championship is upon the fans. A chance to be a part of something special. So here’s to the new season of hope. Here’s to a new beginning of a championship run for the city of Cleveland. Let the party begin in the streets. But not too late. I have to work in the morning. NEW ORLEANS SAINTS AT CAROLINA PANTHERS — 8:25 p.m.
JACKSONVILLE JAGUARS AT CINCINNATI BENGALS — 1:00 p.m.
TAMPA BAY BUCCANEERS AT CLEVELAND BROWNS — 1:00p p.m.
ARIZONA CARDINALS AT DALLAS COWBOYS — 1:00 p.m.
PHILADELPHIA EAGLES AT HOUSTON TEXANS — 1:00 p.m.
N.Y. JETS AT KANSAS CITY CHIEFS — 1:00 p.m.
SAN DIEGO CHARGERS AT MIAMI DOLPHINS — 1:00 p.m.
ST. LOUIS RAMS AT SAN FRANCISCO 49ERS — 4:05 p.m.
DENVER BRONCOS AT NEW ENGLAND PATRIOTS — 4:25 p.m.
OAKLAND RAIDERS AT SEATTLE SEAHAWKS — 4:25 p.m.
BALTIMORE RAVENS AT PITTSBURGH STEELERS * — 8:30 p.m.
INDIANAPOLIS COLTS AT N.Y. GIANTS — 8:30 p.m.